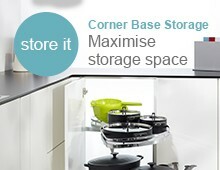 Recycling bins which exceed requirements of the code for sustainable homes. 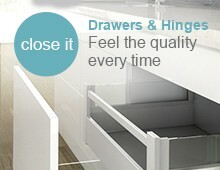 A quality recycling bin for hinged doors on cupboards 600mm or wider. 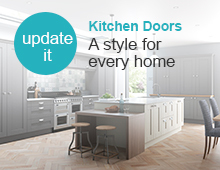 Designed for kitchen cabinets with left or right hand mounted doors or can be used as pull out door. 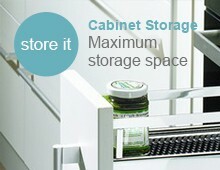 The recycling bins containers are suspended from a metal frame which easily screws to the cabinet base. Simple to use - open your cabinet door and use the bin handle to smoothly slide the bins forward, a lid remains in the cabinet and doubles as a handy shelf. The waste bin comprises of 3 containers for separating different kinds of waste: 1 x 34 and 2 x 17L. 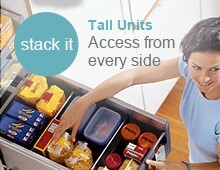 Integrated handles secure bin bags and allows easy removal for emptying and cleaning. Simply screw the pre-assembled coated steel housing to the cabinet base, full instructions are included. 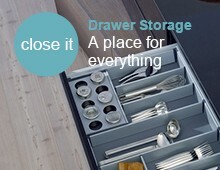 A minimum internal cabinet width clearance, of 530mm is required.